Home > News & Topics > Welcome Party: TUT Global House starts 2018 in a great spirit of friendship! TUT Global House held "Welcome Party 2018" on Saturday, April 7 to welcome freshman students and deepen friendship between students living together. TUT Global House is a unique shared-house style of student accommodation where both international and Japanese students live together. The resident students obtain interpersonal skills applicable globally through the everyday life and events experienced there, so it is very important for residents to get acquainted with each other and build trusting relationships. This party at the beginning of the year is an important event for that, and the senior students have worked hard to organize it. At the welcome party, ice-breaking games gradually reduced the amount of distance between everyone. 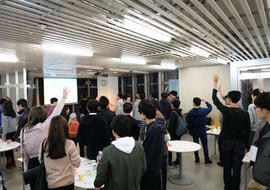 Then at the interaction time, seniors and juniors, Japanese students and international students, as well as faculty members and staff actively mixed and got to know each other. There was around 100 participants in attendance and the party provided an excellent opportunity for everyone to meet new people, share stories and establish a great atmosphere of trust and friendship for the start of the 2018 academic year. TUT established an original course "Global Technology Architects Course (GAC)" specifically designed for Japanese and international students who desire international careers. GAC students live in the "TUT Global House", a unique shared-house style of student accommodation where both international and Japanese students live together. The students obtain global communication capability through the everyday life experienced there, as well as cultivating problem solving skills under diverse value sets and interpersonal skills applicable globally, by planning, managing and participating in various exchange events. Two new buildings have been built, and about 120 students altogether have started new life together from 2018. M&M game: Talk on a specific theme by the colour of the chocolate you picked up. Many interesting & fun stories were shared! Gesture game: Speed competition between the groups. Everyone is serious, but had fun! Pleasant talk: Interacted in a positive atmosphere, showing each other their name cards along with their most appealing attributes. 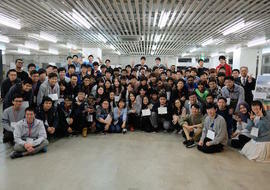 Group photo: Both international and Japanese students enjoyed the party together.